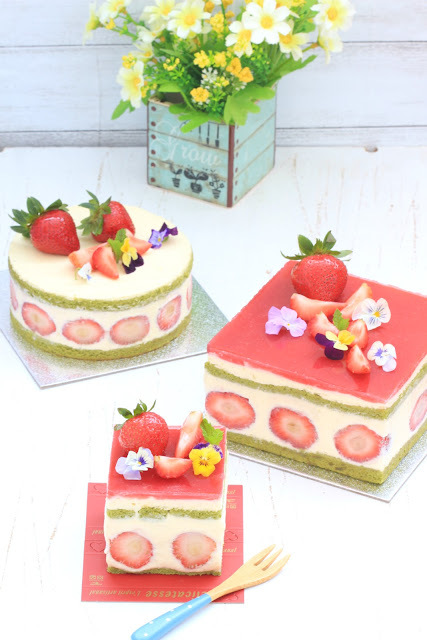 my bare cupboard: Fraisier/French-style strawberry cake "
Here's a lighter version of the popular French gateaux, Fraisier. 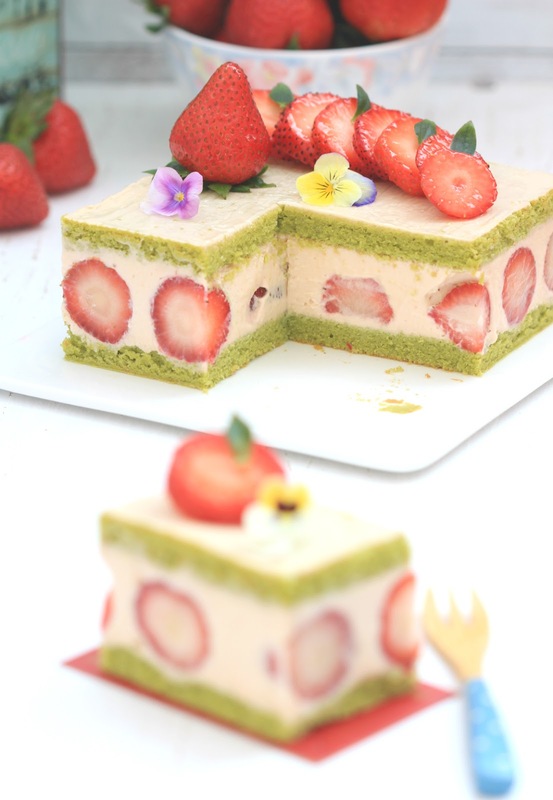 Fraisier comes from the French word fraise meaning strawberry. It is basically made with mousseline cream (pastry cream blended with softened butter), sponge (genoise or joconde), strawberries and traditionally decorated with marzipan. In this lighter version, I used diplomat cream which is made of pastry cream mixed with whipped cream rather than mousseline cream. This is not as stable as the one with mousseline especially during hot summer months. 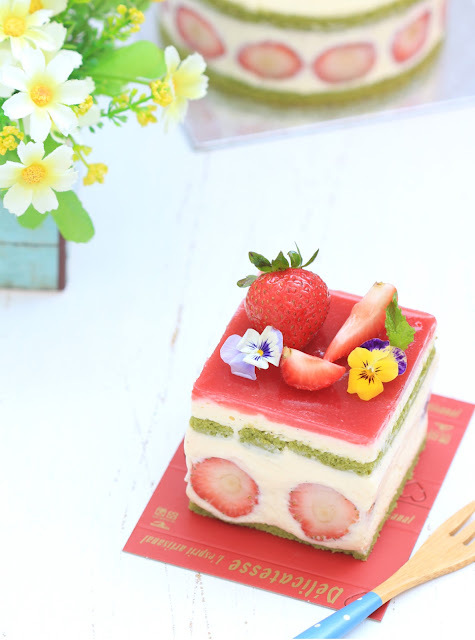 This is another one of my East meets West cake, a not-so classic French gateaux with a Japanese twist by adding matcha to the joconde sponge. The sponge in mini gateaux is actually scraps that I patched up to fit in the 3-inch mould because there's still enough leftover cream. The pastry cream has some gelatine added to make the diplomat a bit firmer. You should also take into consideration the pastry cream-whipped cream ratio, the more whipped cream added to the pastry cream, the firmer the texture. I used 500 grams pastry cream and 320 grams whipping cream to make this diplomat cream and the texture is good enough to pipe. If you want a more stable diplomat cream, do a 1:1 ratio. 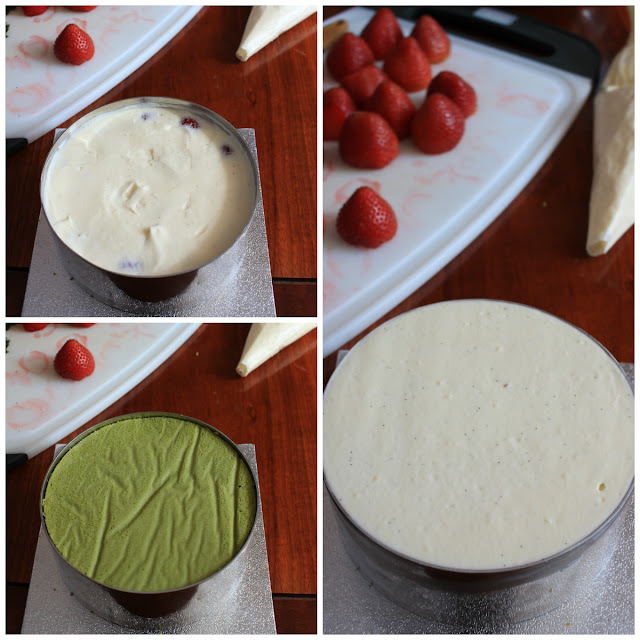 When making this gateaux, set aside a bit of leftover diplomat cream, about 1 tablespoon for patching up the sides of the cakes just in case there are some unfilled gaps/holes after you un-mould it. Note that after un-moulding the cake, some of the berries will be covered with thin film of diplomat cream. To make it more presentable, use a pairing knife and gently scrape the cream off or use a paper kitchen towel and gently blot it off. For the strawberries, you need berries with almost the same size. If using a mousse ring with 2-inch height, the base of berries should be about 1-inch and each sponge should be 1.5-cm thick. The height of the ring that I used in one cake (5x2-inch round) though is not enough to add the jelly so if you have cake acetate sheets, line the side 1/2 inch higher. I used 3 different mousse ring/mould sizes in making these cakes. The one without the jelly glaze is 5x2-inch round, 5x3-inch square and the mini using a 3x2 3/4-inch moulds. You can of course, use an 8 or 9-inch mousse ring, preferably with 2 1/2-inch height but need to bake 1.5 of the sponge recipe. The glaze is a must if you want your berries to look shiny. Of course, on their own, berries are pretty enough. You can probably make a homemade shiny glaze out of a packaged jelly powder, preferably strawberry-flavoured , just reduced the amount of water so that the glaze will be thick. The "crumb shot" photo below is actually from my previous gateaux (different pastry cream recipe and freeze-dried strawberry powder is added to the diplomat cream) as I was just too lazy to take photo of it for this batch. * Chill in the fridge until needed. * In a small saucepan, combine milk, sugar and vanilla seeds and bring to a boil. * In a small mixing bowl, beat the yolks and whole egg until thickens. * Pour hot milk gradually over eggs, whisking as you pour to prevent the eggs from curdling. Pour milk-egg mixture back into the saucepan, let mixture boil, stirring constantly. Cook over medium heat for 3 min or until mixture is thick. Turn off heat and add in the softened gelatine, stir until completely melted. * Take pan off heat, add in softened butter, stir until well combined. * Pour cream on a shallow pan and cover with plastic wrap directly on cream to prevent skin from forming. Chill in the fridge for at least 2 hours. 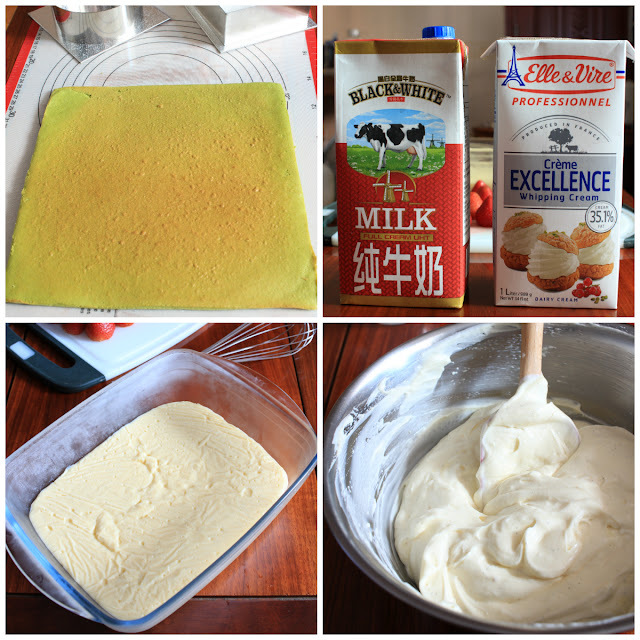 * Take out pastry cream from the fridge and let stand at room temperature until it softens enough to stir easily. Stir pastry cream until smooth, set aside. * Whip cream until medium or nearly stiff peaks. * Fold whipped cream into the softened pastry cream. Chill in the fridge until needed. Strawberries, 500 grams and some extra for decorations. * Wash and pat dry strawberries and cut out the base. * Combine puree and sugar in a small saucepan and bring to a boil, make sure that the sugar in completely melted. Turn off heat and add in softened gelatine, stir until well combined. Pour in a small bowl, set aside. Make this jelly while the cakes are chilling in the fridge. * Cut out two 5-inch square and two 5-inch round sponge using the mousse rings, save the scraps for the 3-inch mini cake. Place ring with the sponge inside on top of a cake holder and place it on the baking sheet. * Place one sponge at the base of one mousse ring. * Place some diplomat cream on piping bag and pipe a thin layer on the sponge base. 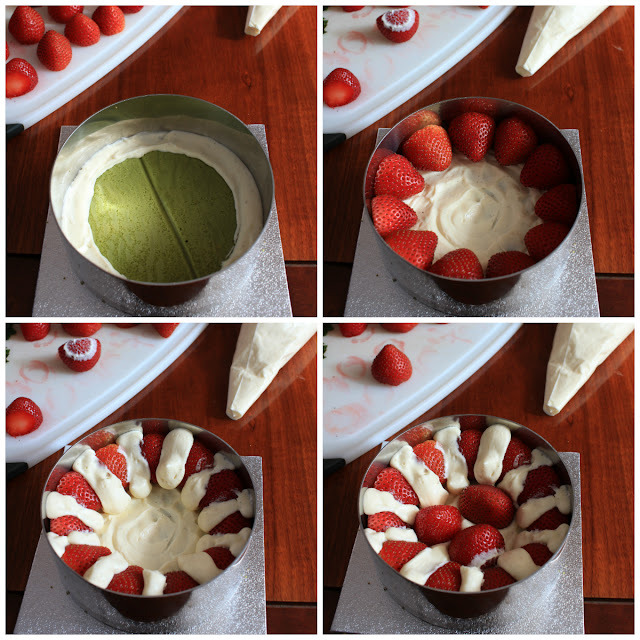 * Place strawberries along the sides of the ring and pipe in cream to fill in the gaps, add in more strawberries in the middle. Pipe more cream to cover the berries and use an offset spatula to gently push down the cream all over to prevent air pockets. Smooth the cream and place in the other sponge, gently push down the sponge, pipe in more cream to cover the sponge. Chill in the fridge for at least 30 minutes before adding in the jelly. * Save a bit of diplomat cream to patch the sides of the cakes just in case there are some small holes/air pockets after un-moulding. * Combine glaze and water in a small saucepan and bring to a boil, stirring constantly. Brush berries while glaze is hot. * Ran a hair dryer along the sides of the mousse ring for a minute or 2 to unmould the cake. * Place back cake in the fridge and chill for at about 30 minutes. * If there are some holes/air pockets along the sides of the cakes, fill holes with the reserved diplomat cream using a small offset spatula and smooth it out. Gently srcape off the thin film of cream on the surface of the strawberries using a small pairing knife or wipe with paper kitchen towel. Chill for another 1 hour before serving. 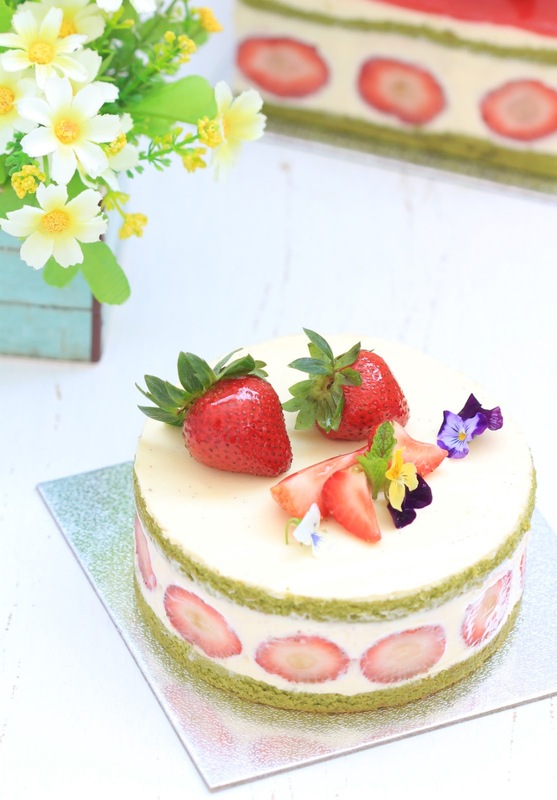 * Decorate top with whole and sliced berries and garnish with edible flowers and mints. You are a cake quess, Anne! 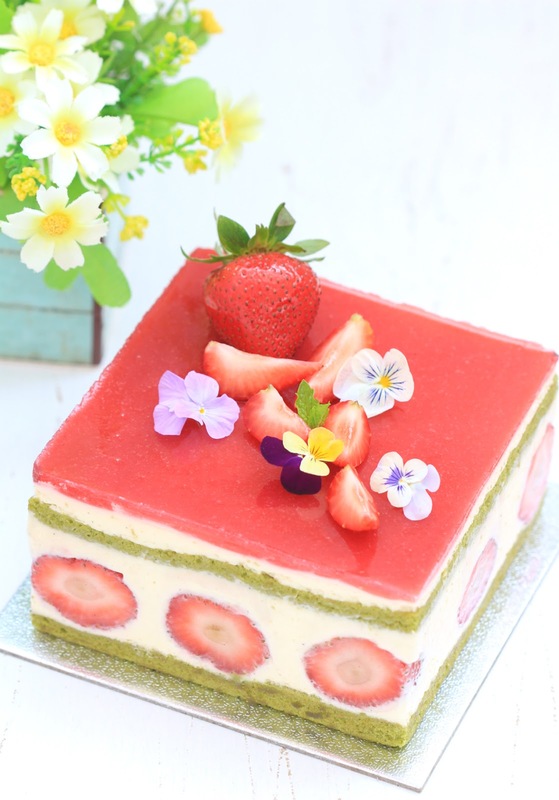 This lighter version of french gateaux looks amazing! Definitely a labor of love, Anne! This cake is a beauty!! !